Independence is something all teens seek. They hope and dream they will someday maximize all they can do on their own. This is no less true for teenagers with autism. 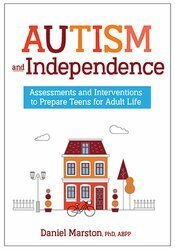 Autism & Independence is a new clinical resource to help teens and young adults with autism become their own person. Focusing on a population often overlooked, autism expert Dr. Daniel Marston wrote this game-changing guide, filled with strategies and skill building exercises. Daniel Marston, Ph.D., ABPP, is a licensed psychologist with over 20 years of experience working with individuals with autism and other neurodevelopmental conditions. He is the owner and chief psychologist at Marston Psychological Services near Pittsburgh. Dr. Marston is board-certified in behavioral & cognitive psychology by the American Board of Professional Psychology (ABPP).